usind Construct2 as a engine. 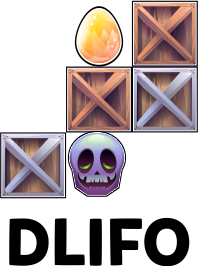 the game that im going to be develing is called DLIFO, which means Dont Let it Fall Off. 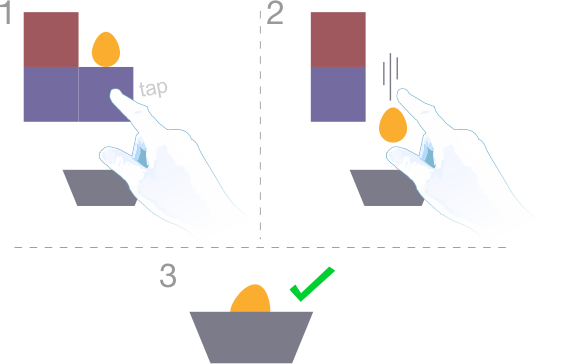 start and the egg fall on a crate, your duty is to put the egg back to a minecar. its very simple, carry the egg to the minecar. how? just tap the crates and they will destroy and the egg will fall. when i was at highschool i created this little game, that is now DLIFO. from scratch and im no programmer so this is going to be hard. Container should stay everytime on the screen. Is this an unique gameplay? by container do you mean the minecar? Oh well, due to map size the minecar cant be always visible but the user can do panning. The immovable metal crates could be more visually distinct from the wooden moveable crates. Maybe make them look more like parts of the scenery, like girders or rock, & less like crates. Are you going to add a destruction effect when you click on something? That would make clicking much more satisfying & fit with the mining theme. As an extra mechanic, how about explosive crates that explode if you destroy an adjacent object? I know you've already got the skulls as things to avoid, but some TNT crates could also play a role in solving the levels (by moving things from their physics impulse) as well as being obstacles. - The immovable metal crates could be more visually distinct from the wooden moveable crates. Maybe make them look more like parts of the scenery, like girders or rock, & less like crates. - Are you going to add a destruction effect when you click on something? That would make clicking much more satisfying & fit with the mining theme. - As an extra mechanic, how about explosive crates that explode if you destroy an adjacent object? I know you've already got the skulls as things to avoid, but some TNT crates could also play a role in solving the levels (by moving things from their physics impulse) as well as being obstacles. 2- YES! and sounds, but for the moment i dont have any musician. 3 - there was a TNT before in the development but due to level design reasons is not inside the main game, but its already in the code. if i find a way to put the TNT back i will put it.